The United States has a well-worn track record of staying strategically silent about certain countries' human rights abuses while lambasting others. Nowhere is this two-track approach more visible than in the small country of Djibouti, located in the Horn of Africa. Since 1999, Djibouti has been ruled by President Ismail Omar Guelleh who, despite having all the authoritarian traits of a despot, has secured international support. This is due in large part to Djibouti's geostrategic position, next to chaotic Somalia and across from Yemen and the Arab Peninsula. Both France and Japan pay $30 million a year to rent the land for their military bases, with the United States paying more than double that for Camp Lemonnier. Djibouti is also set to become the first country to host an overseas military base for China, an asset that reportedly will cost Beijing $100 million a year. And this influx of foreign capital has made Djibouti flourish economically under Guelleh, while also buying one of Africa's smallest nations a very formidable place at the global adults' table. But while economically Djibouti has seen growth, a political culture of repression and corruption still persists. Guelleh's rise to the presidency was guaranteed and enabled by his predecessor, Hassan Gouled Aptidon who was in power for 22 years and was also Guelleh's uncle. Once his turn came, President Guelleh was quick to install members of his Issa clan in top government positions and monopolize control, even when it meant going to illicit lengths. During the 2011 presidential elections in Djibouti, Guelleh enacted a controversial amendment to the constitution that allowed him to run for a third term. Guelleh won the race unopposed while the opposition boycotted the election and, when citizens took to the streets to protest Guelleh's actions, he responded with a violent police crackdown that led to mass arrests, wounded dozens and, tragically, led to five deaths. With new elections planned for April 2016 many are worried Guelleh will alter the constitution once again to allow him to stay in power, something he previously said he would not do, but recently has refused to comment on. Again, the United States is fully aware of these, and other, human rights violations happening in Djibouti. A Wikileaks dispatch from the US embassy to the State Department described Djibouti as "less a country than a commercial city state controlled by one man, Ismail Omar Guelleh. However, if the United States have turned a blind eye to Guelleh's authoritarian and illegal actions, the British High Court have recently put pressure on the president. Guelleh was set to appear in front of the High Court in London, and would have become the first African leader to do so. As part of a corruption case Guelleh's government has levied against Djiboutian millionaire Abdourahman Boreh, the president was invited by Justice Flaux to testify. 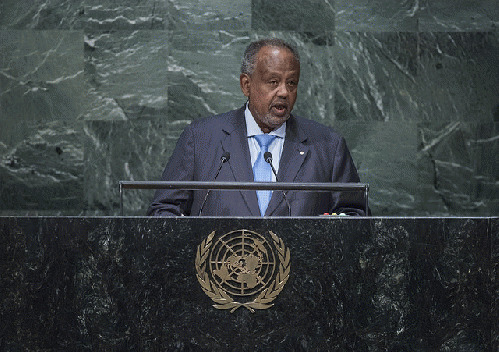 While Guelleh's attorneys agreed at first, the embattled Djiboutian president changed his mind and issued a statement invoking "the higher interests of his country" as grounds for failing to appear in court. This is the second set of accusations brought against Boreh after he was sentenced in absentia to 15 years of prison on terrorism charges back in 2009. These trumped up charges were used as a petty pretext to freeze Boreh's assets, and the decision was later overturned by the British court on the grounds that the trial was politically motivated and the evidence fabricated. With new elections in 2016, the possibility of further violence in Djibouti is very real as the opposition campaigns for a democratic transition from 40 years of autocratic rule. Had Guelleh shown up in court, his country and his polices would have been put under a microscope, something the 16-year president clearly does not want and shows once more that the aging leader has no intention of stepping down. Having eliminated every one of his enemies in the two prior elections, this set the stage for Guelleh to become president for life. President Barack Obama spoke on the dangers of African leaders refusing to step down when their term limits are up, adding: "when journalists are put behind bars for doing their jobs or activists are threatened as governments crackdown on civil society then you may have democracy in name, but not in substance." Djibouti has democracy in name, but not in substance. Will the United States put their money where their mouth is?